Hi Igor. First of all, I wanted to welcome you to this country and wish you the best of luck on the occasion of your hair salon’s Grand Opening. Owning your own business is one of life’s great joys, especially when it’s a successful endeavor – just ask Mike Bloomberg. I hope your pursuit of the American Dream is a success. I’m sure you’ll find that this country offers unprecedented opportunities in business that you wouldn’t find in your native Russia, or Ukraine. Or wherever it is that they name people Igor. Igor, I have a lot of experience in advertising, and I thought I would pass on some of that knowledge to you to help you better prepare your next neighborhood-leafleting advertisement campaign, so that it may be more effective. 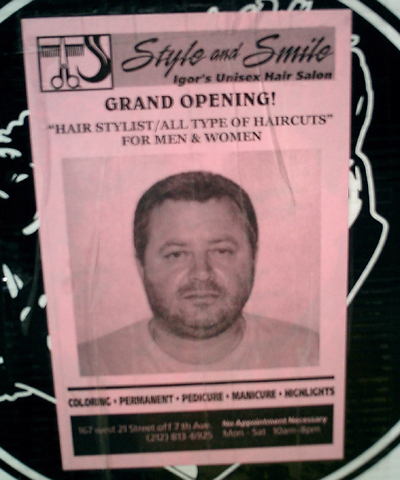 Igor, consumers in Chelsea expect certain things from their hairdressers. For starters, they expect them to be named Michael, Stephan or Christopher. Igor is a tough sell, a name normally reserved for hunchbacks and people in the employ of demons. I realize you have incorporated your name into your business title, so it may not be possible to simply change it to Christopher or Flavio. All I can suggest is making the “o” in your name into a heart, and perhaps dotting your “I” with a daisy. Igor, I have some problems with the photo you’ve chosen for the advertisement. Perhaps that’s you in the photo. Indeed, many business owners fall into the trap of advertising themselves as opposed to their business. It’s important to separate ego from the business model. The guy from Papa John’s keeps putting himself in his ads, as does real estate agent Barbara Corcoran, as did David Thomas from Wendy’s. Igor, I’m against this practice, especially if you look like you just got caught strangling a bus full of cheerleaders. If the photo is to show someone who has received your services, I would suggest a picture of a smiling individual. Perhaps with styled hair, so as to better suggest what your business is capable of doing. I think hair salon models should have hair. Regardless, you don’t want to convey that your customers have been accused of murder. As you’ll notice in your ad, the various services offered (coloring, permanent, pedicure, et al.) do not look like services the individual in the photograph would use. In fact, if such a gentleman came to me for highlights and a pedicure, I would depart the premises and seek employment in Ecuador. If the photo is to show an employee of the establishment, I would still recommend smiling, as hairstylists are known to wield scissors and other sharp objects. Again, the purpose of an advertisement is to entice, not frighten. You want people to identify your business with quality hairstyling services, not grievous bodily harm. Igor, I’ve waived my normal freelance rates so that I could offer these helpful tips, in an effort to help you make the most of your advertising dollar. You’re on your own from this point onward, but I’m certain that some day Igor will be to highlights what Slavomir is to dumplings.